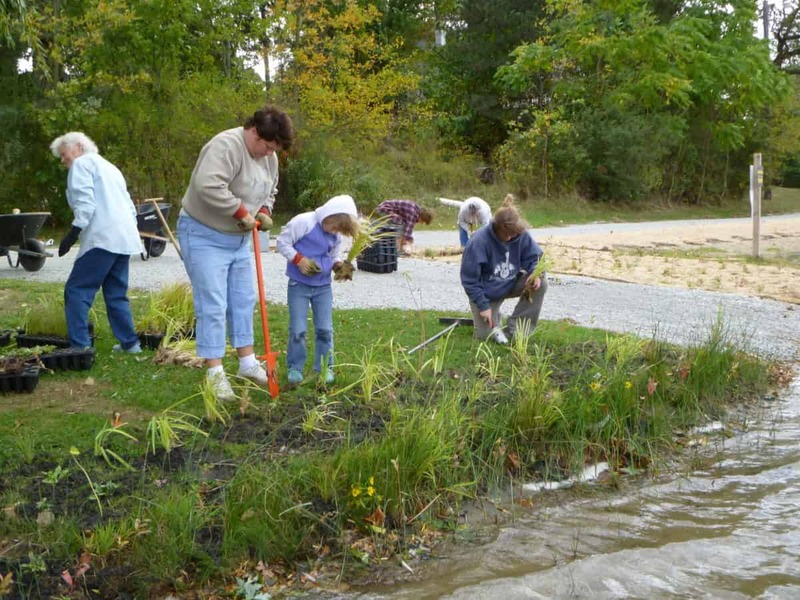 Fifteen volunteers from the Ridinger Lake Association braved a cool damp Saturday morning in September to join representatives from JFNew and TWF to seed a new roadside berm, plant 900 shoreline plants, and install goose netting to protect the young plants through next spring. Funding for the $8,000 project was provided by a Section 319 grant from the Indiana Department of Environmental Management. The gravel road adjacent to the beach was re-graded and a native plant buffer and vegetated swale were installed to reduce erosion and filter runoff from the road. The second part of the project was planting 900 native plants along 400 feet of shoreline to filter lawn runoff and reduce shoreline erosion.